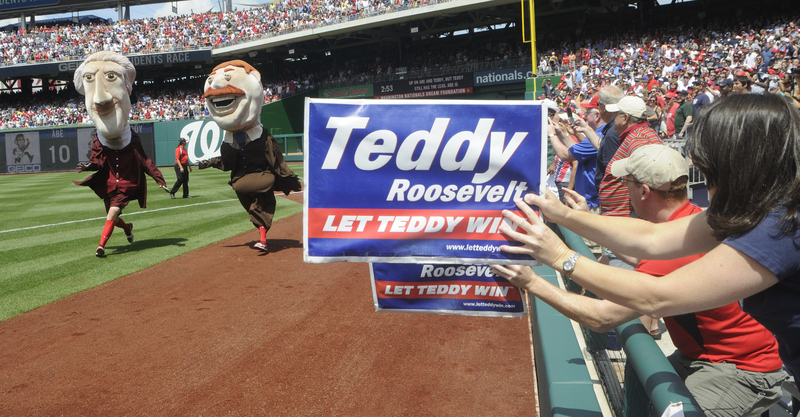 June | 2012 | Let Teddy Win! What happened to Teddy Roosevelt’s glasses? 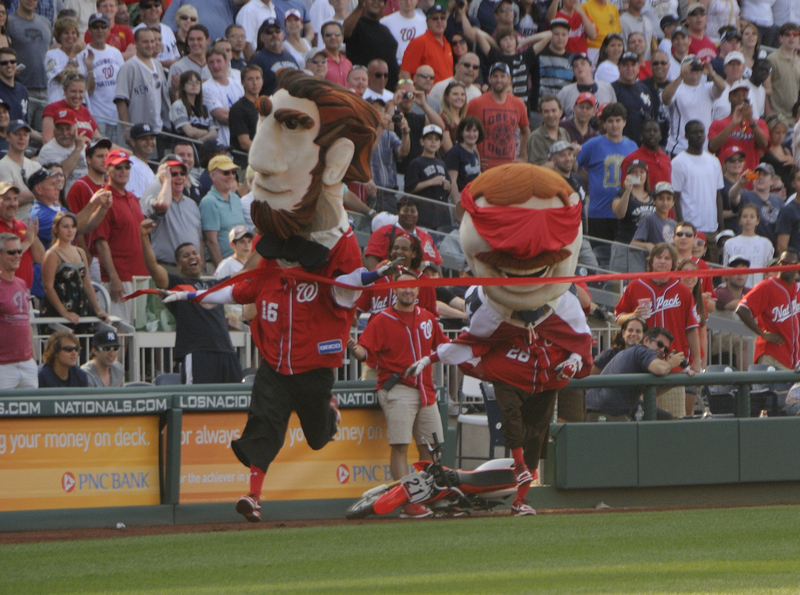 Last Saturday at Nationals Park, the racing presidents held a rare second presidents race as the Nationals and Yankees extended past the 13th inning. Teddy Roosevelt drew attention for competing in both races aboard a motorcycle, overshadowing the fact that he came out blindfolded for the second race. It’s now clear why. Apparently something happened to Teddy’s glasses between those races. 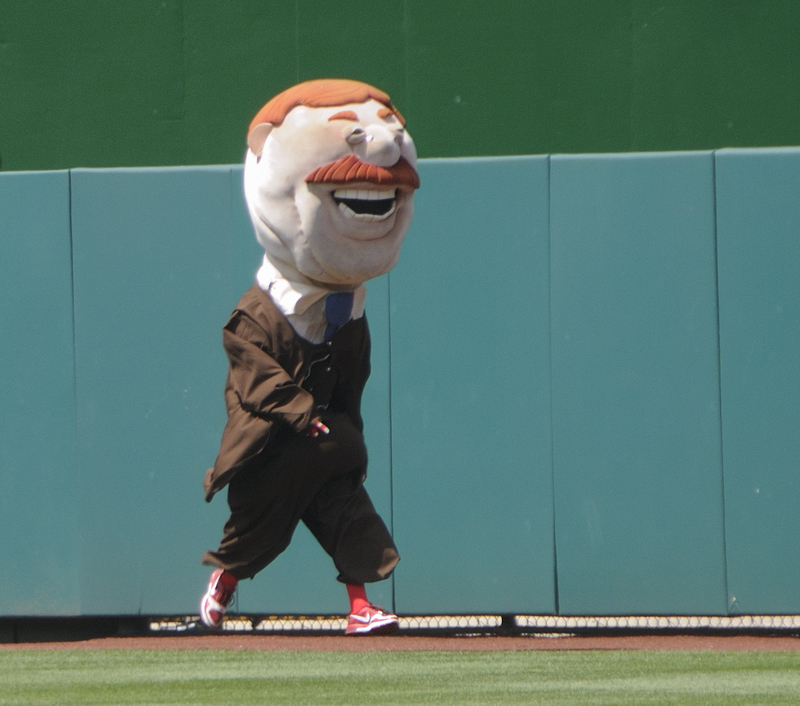 The next day, Roosevelt raced without the blindfold, revealing that his glasses were missing and leading some on Twitter to speculate whether the Hero of San Juan Hill had received laser eye surgery to help him take victory at Nationals Park. Judging by the subsequent race results, he did not. On both Tuesday and Wednesday, still sans glasses, Teddy faded and finished last, losing to Abraham Lincoln and George Washington, respectively. 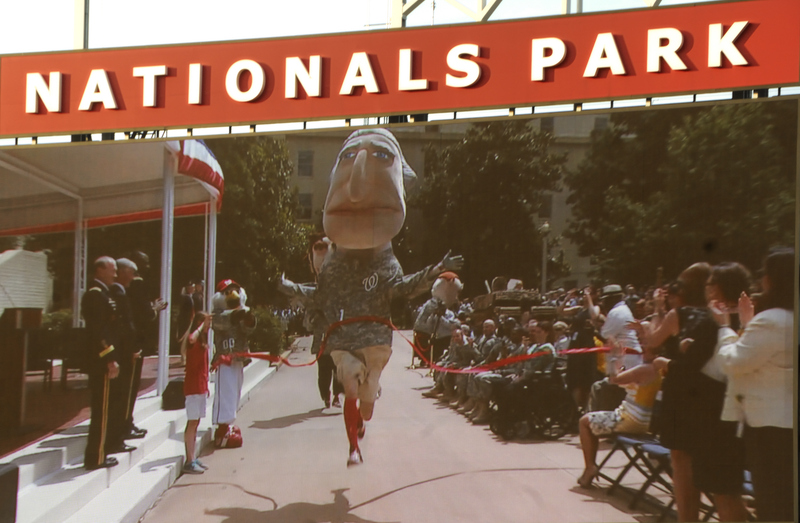 Requests to the Nationals for an explanation have gone without comment, but we’ll keep trying to get to the bottom of this. 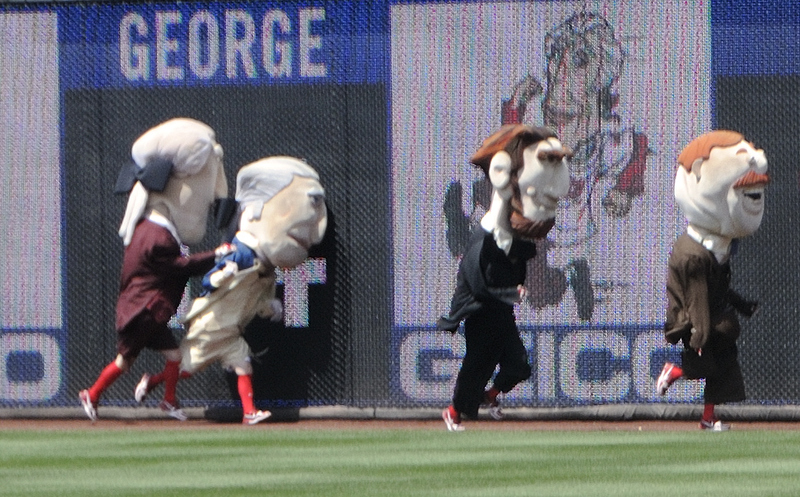 Video: Thomas Jefferson whacks George, Abe and Teddy, but is not disqualified. Bob Carpenter calls for an inquiry. 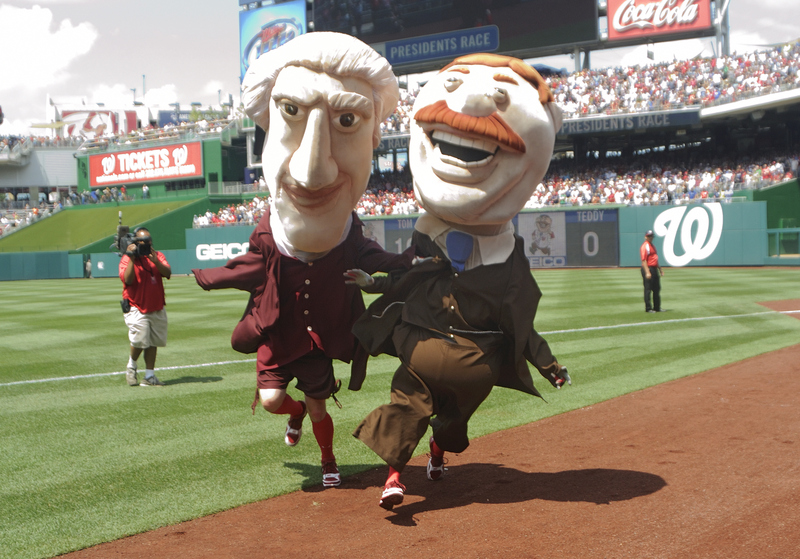 The Nationals’ conspiracy against Teddy Roosevelt was on full display Sunday at Nationals Park, as Thomas Jefferson flaunted the rules to steal a race from our favorite president, yet avoided disqualification. 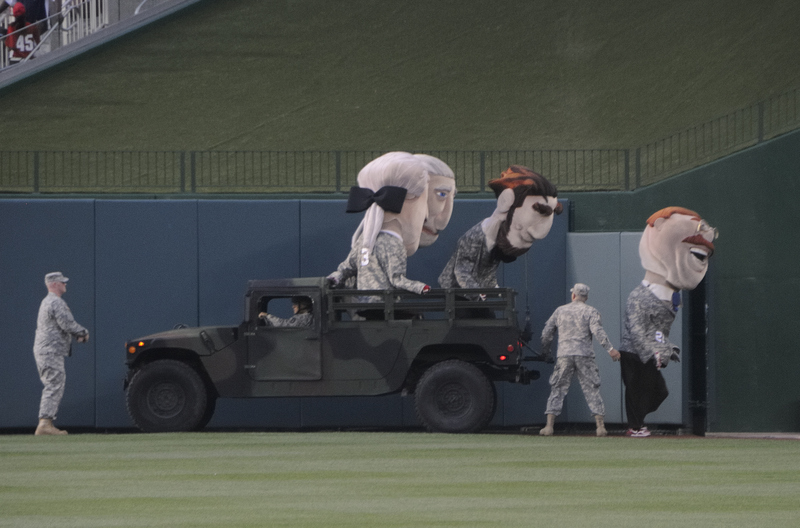 Over the years, it’s been president #16 Abe Lincoln who has built up a reputation for cheating, but something got into Jefferson Sunday, as the Sage of Monticello went on a rampage, first slamming George Washington into the outfield wall, then pushing aside Abe Lincoln in the corner. That left only Roosevelt to beat, and the crowd roared with anticipation as Teddy surged ahead in the home stretch, but just before the finish line, Jefferson reached out and shoved Teddy to the ground. 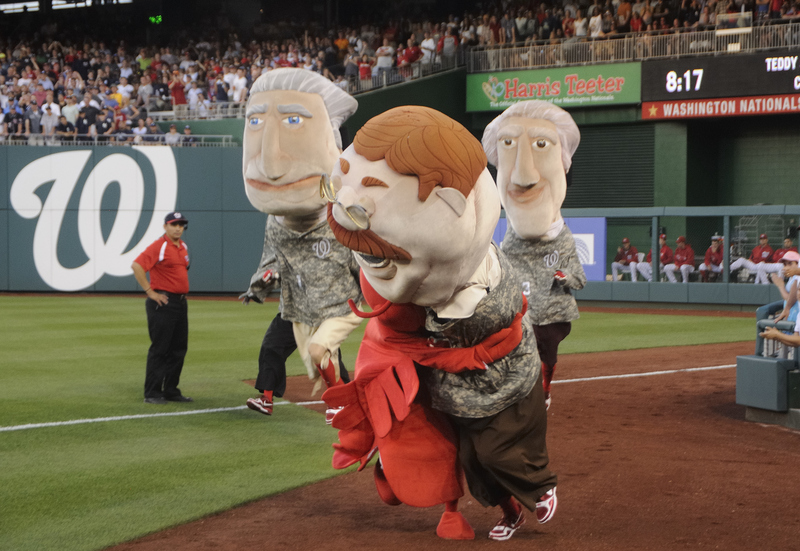 There was nothing subtle about it, yet Screech declared Jefferson the winner. Inquiry indeed. Here’s Carpenter’s call of the race, followed by the finish line video. Note that’s espnW’s Amanda Rykoff holding the sign at Sunday’s finish line. 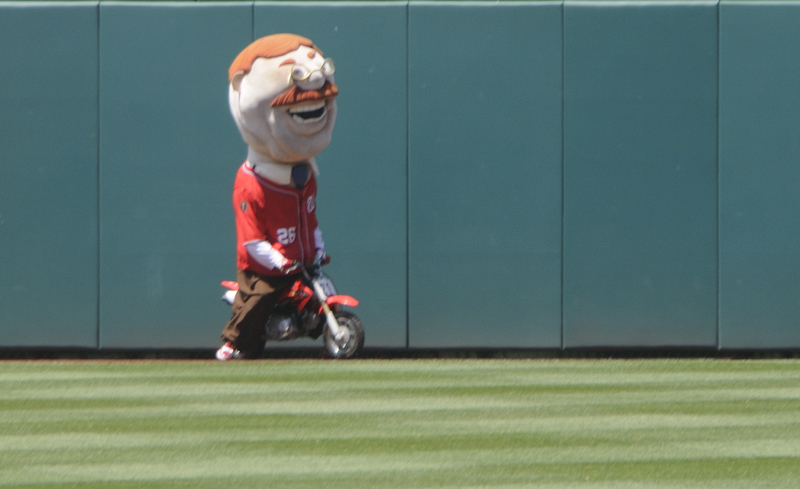 As reported earlier, here are the videos from Saturday’s presidents race extra-innings doubleheader, in which Teddy attempted to win aboard a motorcycle… twice. 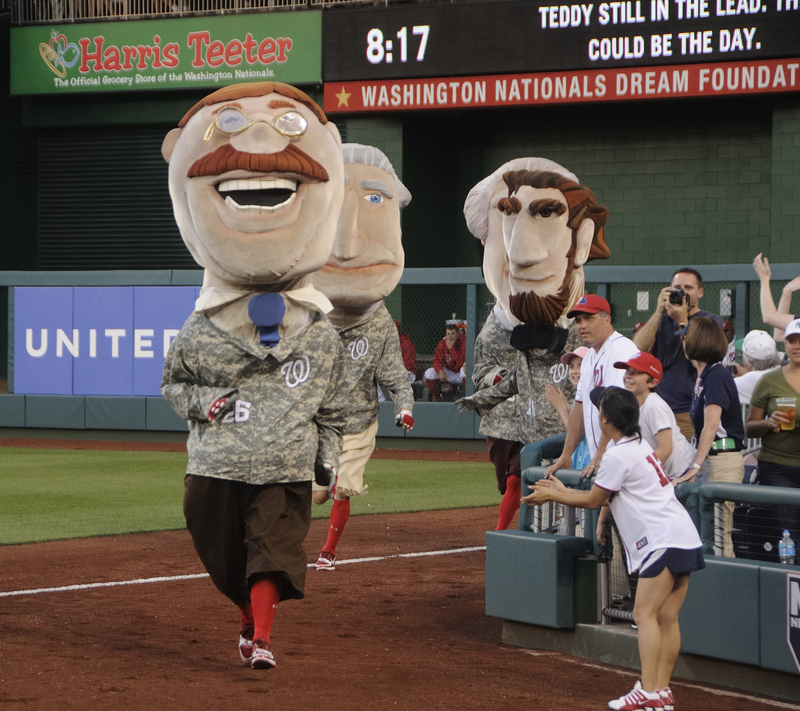 Teddy Roosevelt had two chances to take his first presidents race victory Saturday at Nationals Park, as the Nationals and Yankees took their contest past the 13th inning, triggering a rare second presidents race. Roosevelt threw caution to the wind Saturday, risking disqualification by entering the field aboard a motorcycle. The Bull Moose had speed on his side, but was done in by the details. Teddy started the race by going the wrong way, and by the time he realized and turned around, he was far behind the field. With a sellout crowd of 41,287 cheering him on, Teddy almost caught up to the pack, but Abe Lincoln took the tape, and Roosevelt skidded out, falling off the bike at the finish line. 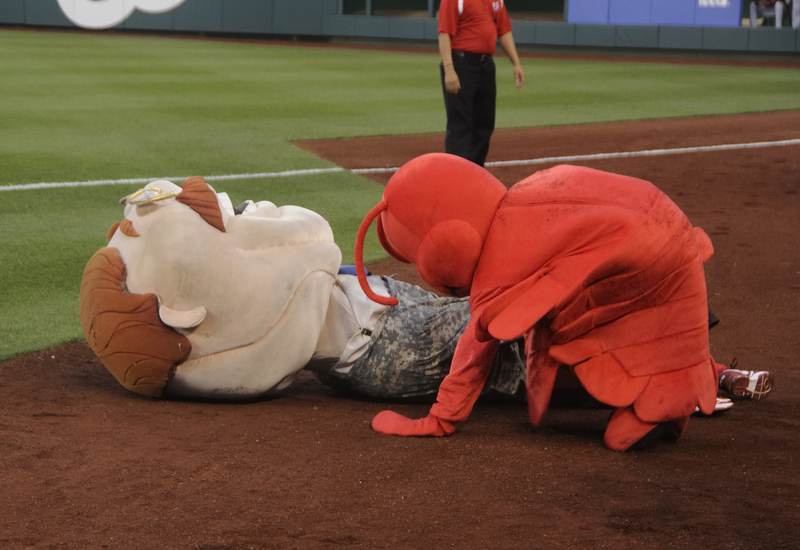 The arrival of the thirteenth inning triggered just the tenth doubleheader in presidents race history, and this time, Teddy was sure to get the directions straight. 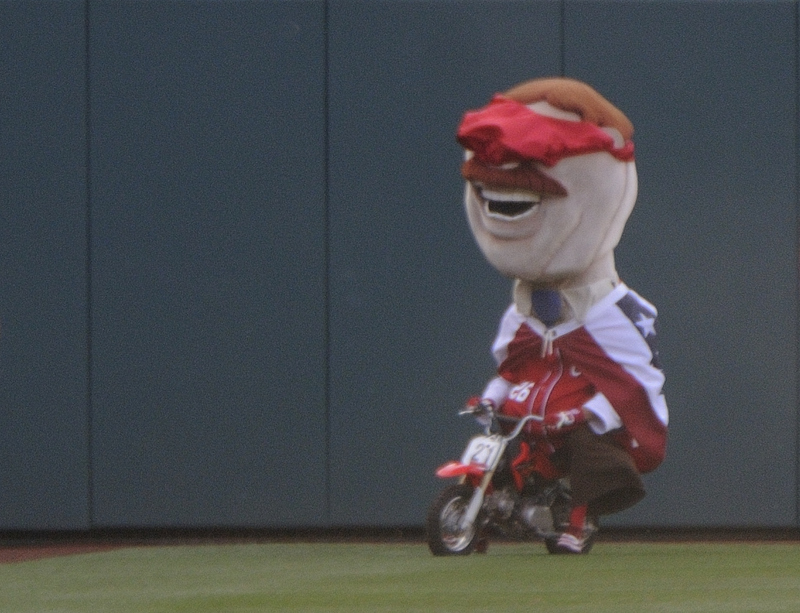 In fact, Roosevelt was so confident, he rode the motorcycle blindfolded. With the finish line moved to the 3rd base side for the second race, Teddy got off to a quick start and took a huge lead. 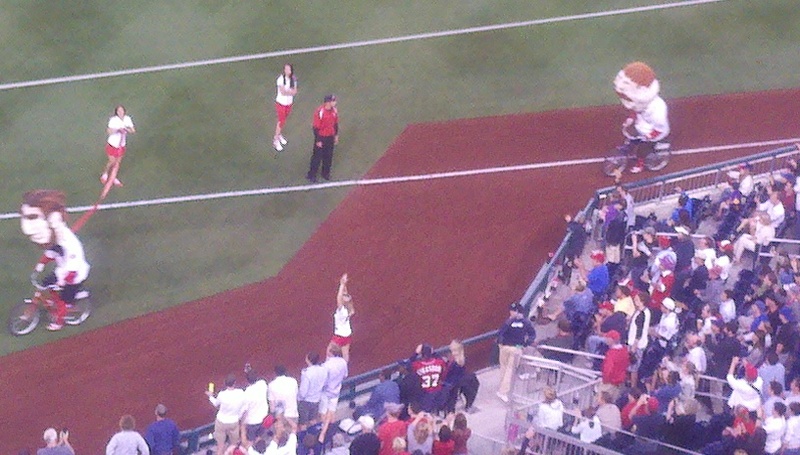 Nationals Park PA Announcer Jerome Hruska got the crowd cheering as #26 pulled away from the pack, but just as it seemed victory was at hand, Teddy started slowing down and came to a stop just short of the tape. He had forgotten to fill up between races, and ran out of gas. 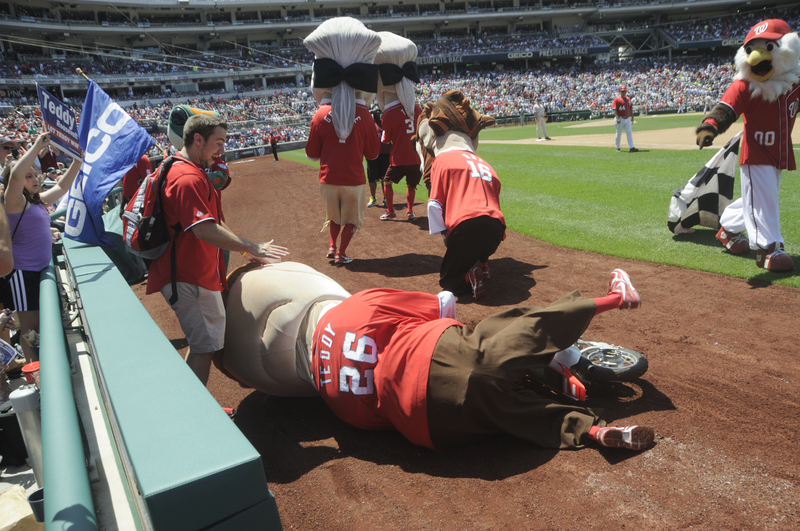 Teddy could have walked across the finish line, but tried getting the motorcycle going, and once again, Abe Lincoln was there to steal the victory. As Hillwood Middle School in Fort Worth, Texas got ready for our yearly 8th grade trip to Washington D.C., we asked the kids, what do you want to do when you are in D.C.? 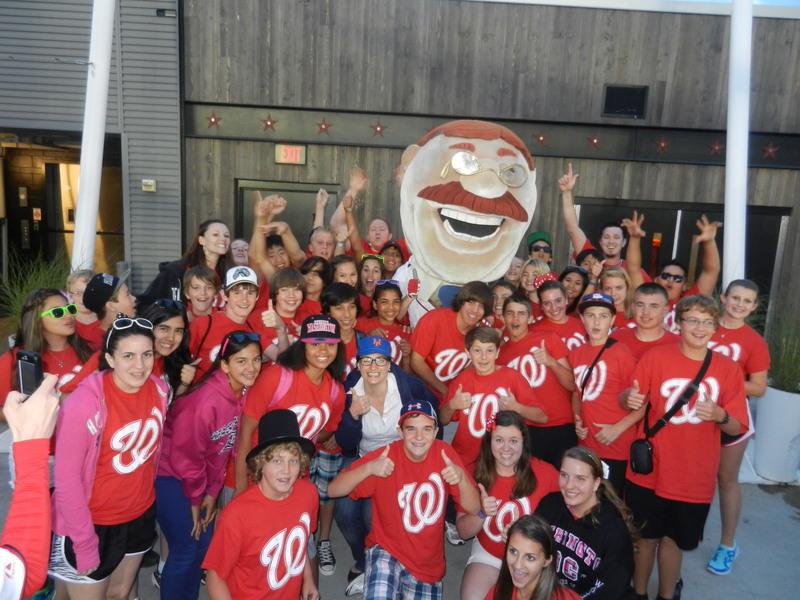 One thing that everyone wanted was to see a game at Nationals Park. 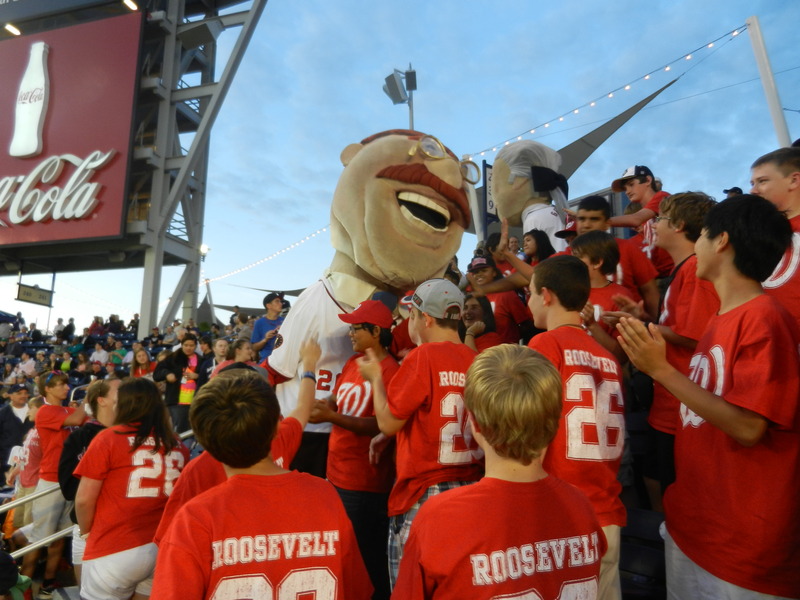 The teachers, already well aware, informed the kids of the tradition at the ballpark, the President Race, and LetTeddyWin.com; so when it was time to design t-shirts for the week, the kids overwhelming voted on custom National jerseys with Roosevelt #26 on them. 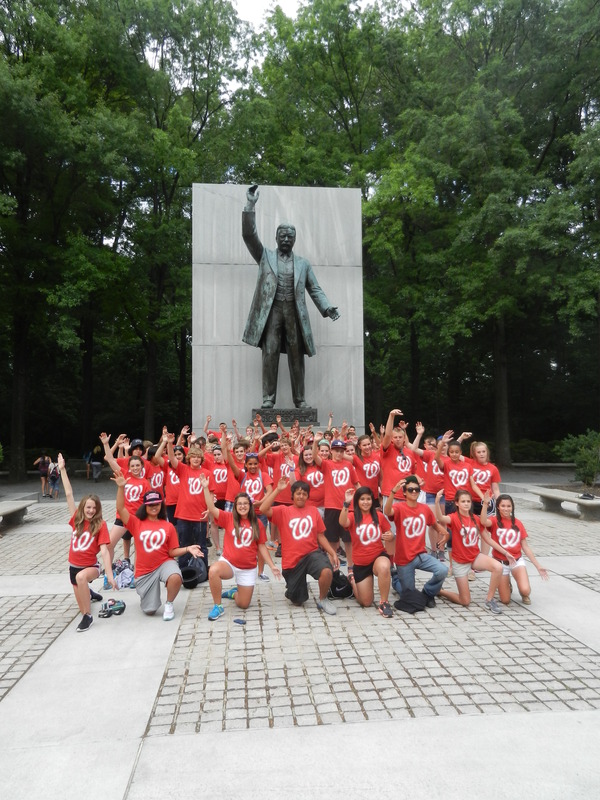 Before the game began, we made an “executive” decision to make a rare visit to Theodore Roosevelt Island to see Teddy himself, and look for guidance before we went to cheer him on. Some of the kids wondered if having so many fans there would push Teddy to victory. After each member of the group touched him for good luck, we headed to the ballpark. 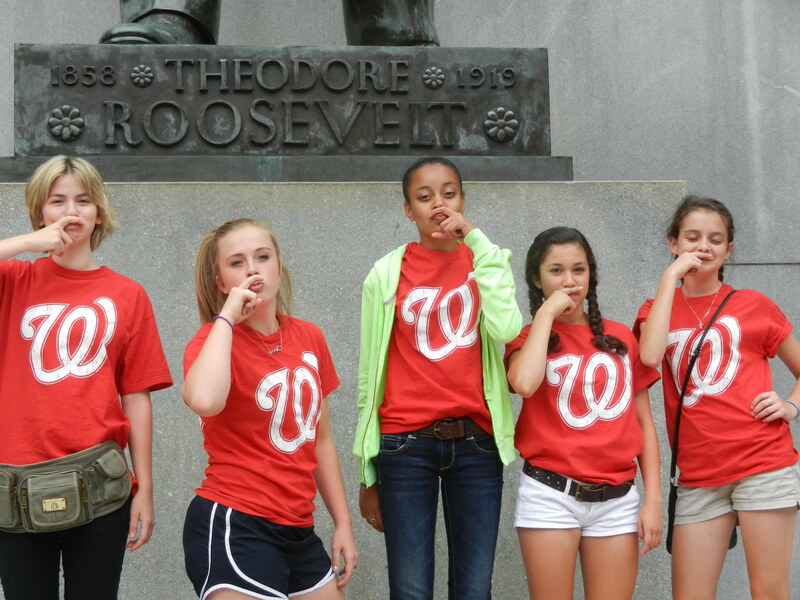 We loved Nationals Park. It’s immaculately clean, from the concourse, to the seats, to even the bathrooms. The ushers were very nice and helpful for such a large group of Teddy fans. The view of the Capitol dome and Washington Monument from the Right Field Terrace are stunning. The game was cruising along with pitchers for both teams working fast, and before you knew, the Presidents were off and running. This race was just ridiculous! 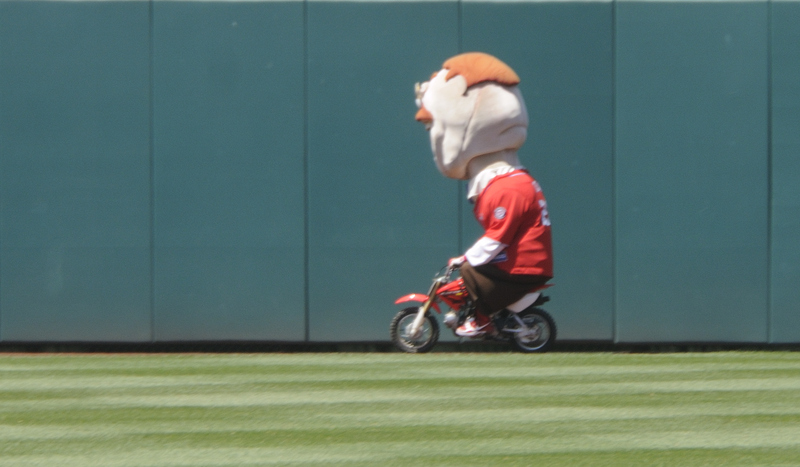 The kids yelled “LET’S GO TEDDY” over and over, but they moved the finish line to the opposite side and Abe biked instead of running. Needless to say, the Teddy fans felt cheated. This is no way to treat a Bull Moose. 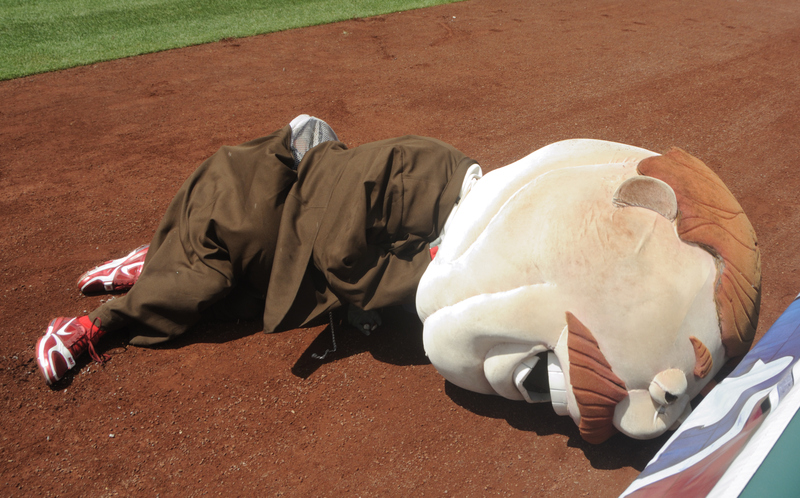 We firmly believe that Abe should be tested for PEDs. After the race, while some of the kids were looking for the eight pound StrasBurger, (they didn’t find it), the game got interesting. Both managers emptied their bullpens as the game wore on. The crowd shrunk as the game entered extra innings. We received a surprise visit from Teddy, who came and joined us in section 238. He combed his moustache, cleaned his glasses, and took photos with the group. It was pretty cool to meet the great Hero of San Juan Hill. The kids were excited. 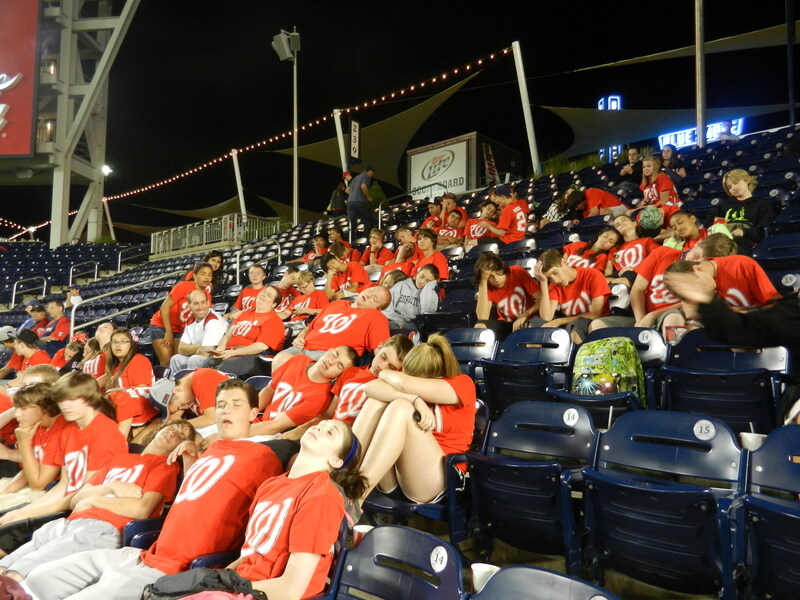 The Teddy fans were exhausted and ready for bed, but they had decided they were staying until the last out. A few of them, (myself included) admitted they were hoping it would go to the 13th for an extra innings President’s race. 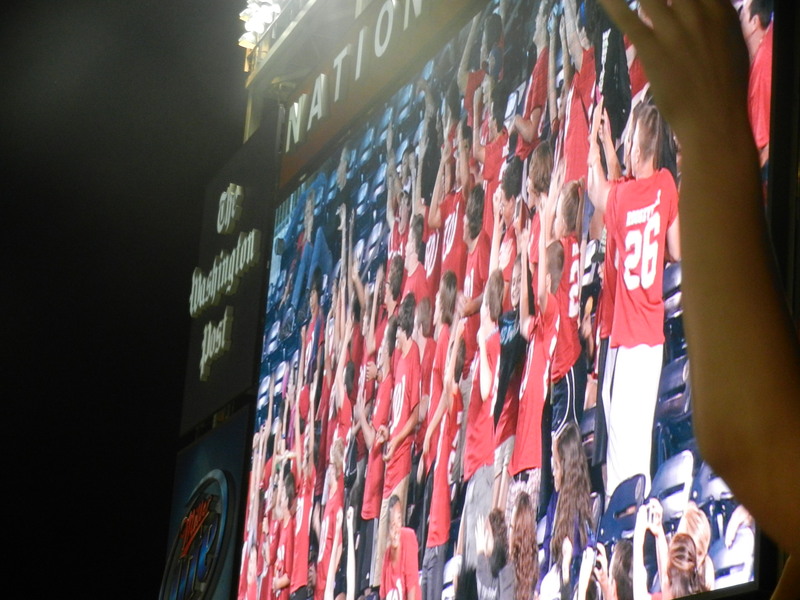 The Nationals TV and scoreboard crew must have noticed the loud group from the living Hillwood Middle school because they showed us over and over on the TV broadcast along with nearly every half inning on the HD scoreboard. The Mets rallied from behind to take leads in the top of the eighth, 10th and 12th innings — only to have the Nationals tie the game in the bottom of the frame each time. The game was finally won on Bryce Harper’s first career walk off. History was witnessed. After years of being the NL East’s doormat, The new Nationals are 1st in War, 1st in Peace, and 1st in the National League East. Photos/Brian Ketchum. For more on the Hillwood DC trip visit Coachketcham.com.